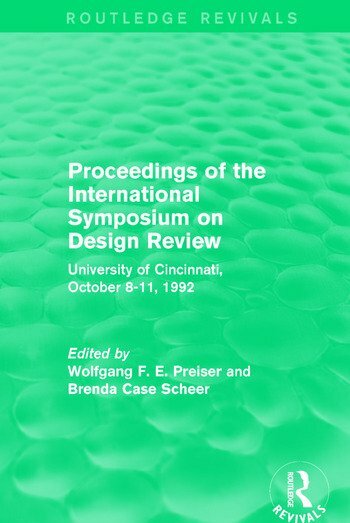 First published in 1992, this book collects together the papers presented at the International Symposium on Design Review which was held to address the growing tendency of local governments to institute programs of aesthetic control. The editor argues that the widespread adoption of design review processes in the years preceding the conference necessitated thoroughgoing professional criticism and a number of areas of debate are identified and addressed in the subsequent papers. Are the difficulties experienced by planners, community activists and architects with the process due to its relative youth or inherent flaws in the entire concept? How should mechanical problems like time and expense, the ease with which the process can be manipulated, and general inefficiencies in the system be resolved? More intricate problems are also addressed, such as: who has the power to judge the aesthetic quality of a building, whether design review infringes on the rights of the individual especially under the First Amendment, whether the design review process is "fair", and the difficulty for the reviewer of deciding what is right and what is wrong having taken into account factors that can be highly subjective or contradict more practical concerns.